Fall is just around the corner. One of my favorite things to do in the fall is bake. There is nothing more satisfying than the cool crisp weather and a cozy house filled with the smell of warm goodies. 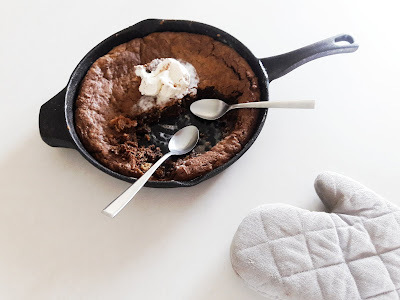 Today I am going to share this chocolate chip skillet cookie. It is one of our favorites to whip up to satisfy those sweet cravings. In a nine inch cast iron skillet melt the butter on the stove over medium heat. Stir consistently until the butter becomes golden brown. Whisk in sugar, brown sugar and vanilla. Remove skillet from heat and allow to cool for five minutes. This will ensure the eggs don't start to cook in your batter. Add in the egg and egg yolk and whisk gently until well combined. Add flour, baking soda, and salt stirring until just incorporated. Fold in your favorite chocolate chips. 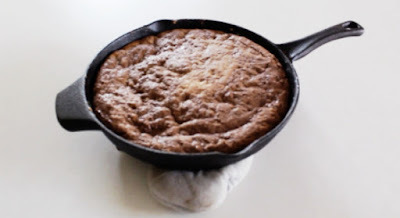 Spread the dough evenly across the skillet. Bake for 18 - 20 minutes until edges begin to turn golden brown and a toothpick inserted in the middle comes out clean. Top with ice cream, optional. This has been one of our favorite go to desserts for years now. It is quick, easy and tastes delicious. We always end up eating until our stomach hurts and it is well worth it! The dough is a perfect base to turn this into any cookie you want. Add in M&M's, Peanut Butter Cups, Sprinkles, whatever you'd prefer! 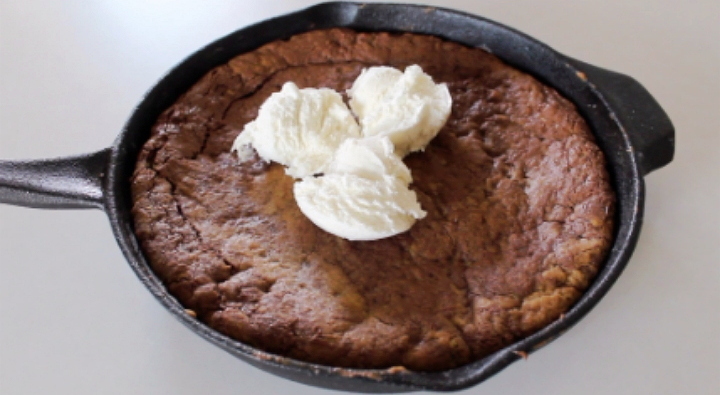 Have you had a skillet cookie before?